Enjoy a Keys sunset by the dock in our Tiki Hut Beach area overlooking the Marina. Immerse yourself in the heated pool or book one of the many dive, snorkel, fishing boats or try your luck on the casino ship! All right outside the hotel's doors. Tour groups, school groups, church gatherings, family reunions and groups of all sizes are welcome! The newly remodeled Ramada Key Largo offers beautifully appointed guest rooms. Each of the spacious rooms offers a private balcony overlooking either the harbor or island, allowing you your own private paradise! Rooms feature either one king or two queen beds. Pamper yourself in luxury in one of our King Jacuzzi suites. Each spacious suite has 2 bathrooms, one with a private Jacuzzi, king-size bed, wrap around balcony, and living room with a queen pull-out sleeper sofa. 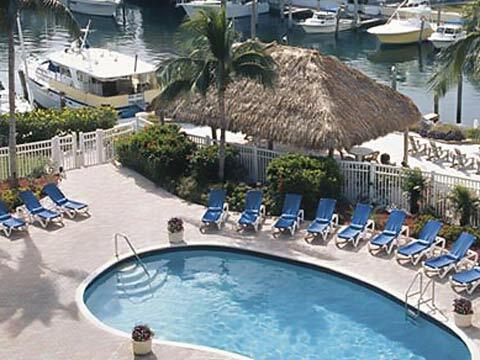 The Ramada Key Largo Resort and Marina is the ultimate vacation destination for a Key Largo getaway. You can work on your tan at our harborside heated pool, experience the exciting watersports the Florida Keys are famous for, try your luck onboard a Casino Gaming Ship and take care of your appetite at our neighboring Bogie's CafÃ© or enjoy a tropical drink at our Key Largo Resort poolside tiki bar. Watersports/Marina and Fishing Village Key Largo's claims to fame are the exciting watersports available in the area! Our 75-slip marina offers charter boats for Deep Sea Fishing and Back Country Fishing. Snorkel and Dive trips to the famous John Pennekamp Coral Reef State Park and Marine Sanctuary leave twice daily but that's not all there is to do! The marina has boat rentals, glass bottom boat, and sunset cruises so that you can enjoy the best that the beautiful blue water has to offer. If you have a boat, bring it along and dock it at our 75-slip deep-water marina located on the property. If you don't have a boat, rent or charter one from one of the many quality crafts available. Deep sea and back country fishing, glass bottom boat and dive and snorkel trips run daily.. Click here for more information on our Marina. Casino Gaming Ship All of our guests are invited to try their luck on the Casino Gaming Ship! The 100 foot gaming vessel is anchored 3 miles off shore. Sun Cruz Casino offers entertainment, hors d' oeuvres, and cocktails. Play Black Jack, Dice, Roulette, slots, and more! The Ramada Key Largo Resort and Marina can make your next event a huge success! Let our courteous, professional sales and catering staff exceed your expectations. We specialize in corporate, school groups, church gatherings, family reunions, and groups of all sizes are welcome! To check group capacity and availability, fill out the form below or for more information, please contact our sales office at 305-453-7150.